The relentless spread of farming around the world over the past three centuries has been captured in a new global animation. The map, produced by Radical Cartography , shows the amount of the world's surface given over to agriculture over the three centuries leading up to the year 2000. Back in 1700, much of the world had no agriculture at all, on any scale. Those places that did used relatively small amounts of land, were inefficient and produced low yields. The map shows that in 1700, outside of Europe and Asia there was a very small proportion of land being farmed. The 18th century saw an increase in arable land for use and the beginnings of a vast improvement in agricultural yields. New farming methods, such as four-field crop rotation, the increased use of fertilizer and increasing mechanization, opened up additional swaths of land for agriculture. Technology developed in the First and Second Industrial Revolutions saw farming rapidly expand into previously untapped areas, such as the American Great Plains in the late 19th century and Argentina in the early 20th century. Expansion and intensification of existing farming continued into recent decades, with Brazil and central India becoming more intensely farmed since the late 20th century. Historian and cartographer Bill Rankin argues that existing arable land has become "more and more agricultural". It is estimated that the productivity of wheat in England went up from about 19 bushels per acre in 1720 to around 30 bushels by 1840. In recent years intensification has increased and land expansion has slowed in the developed world. This is largely down to the increased use of fertilizer , which has improved production yields. Unlike the previous 300 years, increasing the area of farmed land will not be enough to meet food demand, nor is it sustainable for the environment. 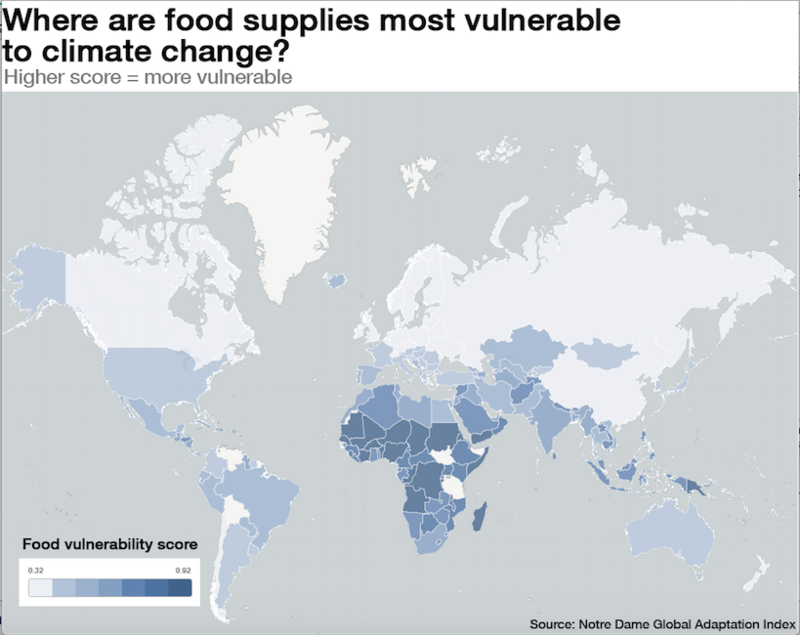 The current global food system faces serious challenges. There is increasing demand for food as the world’s population grows rapidly; it is expected to reach 9.5 billion by 2050. 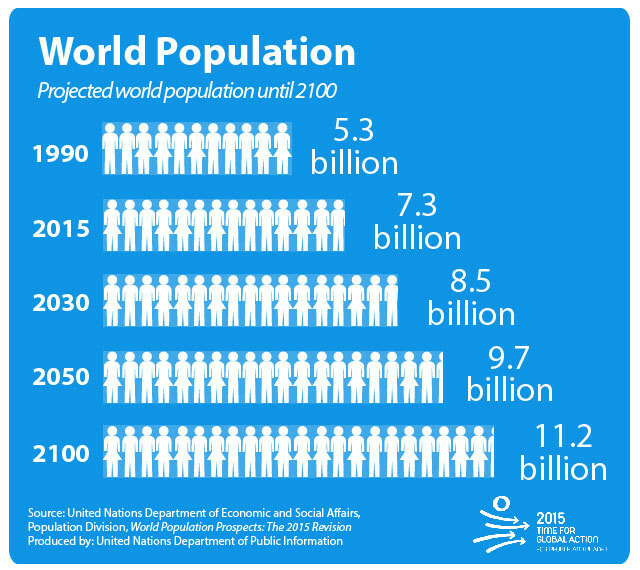 This will increase global demand for food by 60%, while currently 795 million people go hungry every day. The spread of agriculture is far from over: vast stretches of Africa, South America, and South-East Asia can still be opened up to agricultural uses. However, environmental concerns must also be addressed. Preserving the rainforest will require further intensification elsewhere. Agriculture is responsible for 30% of greenhouse gas emissions and climate change increasingly threatens food systems. Intensification must also be sustainable – industrial agriculture uses huge amounts of water, energy and chemicals, which increase pollution of arable land, water supplies and the atmosphere. In a nutshell, this means the world needs to produce more food than ever before, with less land, while not damaging the environment. In a new report, produced in collaboration with McKinsey & Company, the World Economic Forum sets out a vision to provide food security, environmental security and economic growth. The report, titled Realizing a New Vision for Agriculture: A Roadmap for Stakeholders , suggests that agricultural development can be environmentally, socially and economically viable if it is approached as a market investment rather than as short-term aid.